We celebrate our friend, David Livingston. A celebration of David’s life will be held on Saturday, April 27 at 12 pm in the auditorium at Bowen Park, Nanaimo, BC. David’s hand-painted sign in his front yard letting everyone know that he had enough pots, already! David Livingston entered my life in a dramatic way. I was just an 8 year old boy who’d heard his parents talking about an Uncle who lived up in Canada but my mind was busy absorbing my quickly changing world and the idea of relative I’d never met had stayed out of sight and out of mind for 8 years. I was a young boy quickly discovering the world outside of the umbrella of my parents. I didn’t care to occupy myself too deeply in grown up affairs, but there was an exception: I had spend hours upon hours become an expert on cars. The kids on the street were obsessed with a card game where you where dealt a hand of cards representing cars and as you laid down your cards the best car one the hand, based on differnt feautures the cars had. Long hours of enjoyment as well as considerable anxiety had gone into advancing my knowledge, and after struggling I finally found confident with the lessons I’d learned: Italian sports cars are awesome, don’t waste your time with car that has less than a V12 engine and don’t plan on spending less that $100,000. Needless to say I was deeply skeptical of my Father’s of buying Chevy’s. But everything changed when my mysterious Uncle showed up one day with a car resebling a small UFO more than a shiny red Italian sports car. As the whole family was just as curious as I was he begin explaining the story of how he made it and its unique capabilities that made it as much a mobile home as a car, like hand built cabinets for stowing away belongings in the cleverst of places, and the almost quimsical dome built in the roof of the car so he could stand up and peer out in all directions. Suddenly my hard fought for wisdom about cars was shattered: the Cooper/Mini engine couldn’t have been more than 4 cylinders, cost far less than $100,000, was partly homemade, its 0 to 60 mph time was worse than mediochre, and yet he had home that had the appeal of a toy and allowed the freedom of being able drive accross the country with everything he needed in a care free way. If there were features the car didn’t have he could simply build them in himself. I was shocked that the shiny red Ferrari had been beaten single handedly by a little cleverness. While I felt shocked my car experice had been upended, the main response that came to me was deep inspiration and excitement. I had begun to learn a lesson David’s life taught so well: in life its important to know what won’t make you happy, abandon it completely, know what will make you happy, and follow that with enough passion that conventional obstacles to living freely suddenly seem small and self reliance and independence becomes something you can rely on. The excitement grew as I turned my attention from the car to the creator, my charismatic new Uncle with a gentle smile and a child like enthusiam, and yet adult enough to build a mobile home and live an adventuresome life style full of traveling to places I’d only seen in my school books. I sensed that something good had begun and realized that since I was his family I’d get to keep him forever, or basically forever from the view point of an 8 year old. Davids self construed mobile life style meant frequent visits to our home in Connecticut and Virgina where Davids mother and my Grandmother lived. As I grew from an 8 year old boy to a teenager to an adult I got to know many sides of David and much of what I’ve learned in life has been complemented by the simple wisdom that radiated from David. He never gave up his inner child in the way that many people feel compelled do as they become adults, but along with David’s refreshing childlike personality was a adult with an admirable patience that maintained without any resistence. One of the obstacles life delt David was Type I diabetes, and I remember him speaking of all the self taught techniques he used to combat an inconsistent blood sugar level, and while the techniques and the disease contrained his life style he patiently stuck to the changes he could make and never let himself lose site of the improvements to his life his labors realized and didn’t get overly dragged down by the degradation of quality of life that diabetes always carries. Even when his eye sight got worse and worse he focused on the close up things he could see, and refused to see the mountains and seaside of British Columbia as anything but beautiful as they became blurrier every year. His patience took him to Harvard and graduate school at UPenn where he studied architecture and he had a passion for learning. One thing David decided he wasn’t interested in was a war against peasants in the villages and jungles of Vietnam, but in freeing himself from this by moving to Canada he would have to rely on his independent spirit to compensate for the contraints his decision put on him. But he put his academics to practice and with very little money he was able to build his own log home in the backcountry of NOrth Western Canada that looked more like buddhist temple than a traditional log cabin. He decided to move on from acamdemics but never gave up on being a student of life, and these studies made him find a most unique solution to the age old decision of what to do with your time on earth. David was freed from the tethers that come with many of the conventional solutions many people follow as he decided that extra money was not something he would center his life around. Through careful planning, authentic frugality and driven by the freedom he would gain from an alternative lifestyle, David got by working only when he needed the money and stayed clear of the luxeries that many people enjoyed increasingly in his lifetime. In return his free spirit was unburdened by the confines of a steady job and was able to travel and see new places and stop by to visit friends he had all over the continent. Changes in lifestyle that may have been hard for many people became second nature to David, who was blessed with the self knowledge that let him be free, without feeling he needed help in being happy by outside sources. His pleasures where simple: good food ( often elaborate experiments which were more fun to make and try than they tasted good ), nature, a good laugh, and good company with good friends. He was a gentle kind hearted soul who had an unwavering good natured character that made him hard to not like. In the later years of his life he generously made the world a better place one tree at a time by planting them in yard, in neighbors yard, spreading his good will while never having the ego to believe that the smallness of the changes to the world he could make where anything to feel disapointed by. David never had children and I remember just a few times that he was a little taken aback wondering what his role should be as an uncle when I was still young. Whatever came of these hestitations, his original strategy worked better than any contrued one could have: simply being real, generous, friendly, light hearted but caring. In the end I didn’t get to keep my uncle forever, but while he was here he was the best possible person to teach people like myself about life by example, and lead a inspired happy life where he ascended past the obstacles of discouragement, negativity, reliance on a canned model of what life is for, and the burden of feeling the need to be stubbornly serious even when its utility has passed. I never talked about death with David and his passing came far sooner than I expected, but I think his outlook would have made this inevitable jounrney into the unknown less burdensome than facing motality can be for some people. He passed in his sleep in the most gentle way. I don’t think David would have wanted us to feel overly down troden by about his passing. He will be missed dearly, and his memories and what his life can teach us all will live on. David always impressed me with his positive attitude and apppreciation of life. In spite of failing health and eyesight he always made the most of every moment. I would watch him sitting in the front row of the Symphony so that he would miss nothing.He did not let anything stop him from doing what he wanted to do. We should all take a lesson from David, and clear the hurdles that life puts in our way. Happy to have known you David. David had this uncanny ability to stop by the house every time my trees needed pruning. Together we would cut one branch off at a time – having a great discussion in between each one. He helped me to see that the simple things in life give us the greatest pleasure. And just to let you know my friend I am still growing that walnut tree for you – when it is ready I will plant it in your honor for all to enjoy. Some people fit a mould — a reference frame — while others effortlessly avoid being put into a stereotype. David was always in this second camp; he was an individual through and through. And as an individual he must be put into the highest order, for he didn’t aim to shape the world but rather accept it and find enjoyment in it. His endless curiosity, unselfish will, lack of material weights, and his uncanny ability to see the positive even in tough situations was wholly admirable and a completely natural way for David to exist. I will never forget when he told me about how he had taken his decreasing eyesight as an opportunity to see the things that were close to him in greater detail. This was exciting to him. He had been forced to see beauty that he had passed over when his vision was unimpaired. No one would have blamed him if he felt anger or loss but somehow instead he had felt happiness. The world needs more David Livingston’s; I’m glad that I was lucky enough to meet the original. If anyone is interested. I have a brief profile of David and his family tree. If there are facts that you could add to complete his life story I’d be grateful if you could just reply here and I’ll get them incorporated into the family tree. David was a beautiful, kind soul and a great plantsman. 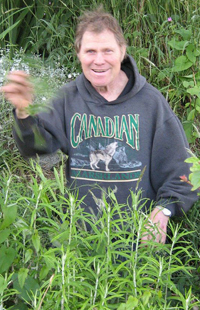 I knew him from our mutual association with the BC Fruit Testers, and he was truly committed to growing and testing fruit, while also sharing his knowledge, and his plants, with others. His health struggles did not stop him from enjoying his passions in life or diminish his positive outlook. He was, indeed, one of a kind, and he will be greatly missed. His legacy will remain, in the hundreds, perhaps thousands, of fruit-bearing plants that he propagated. Thank you, David, for all you shared. David was such a gentle, generous man. So many people will miss his smiling face.